Hello everyone, I really want to start doing a ‘How To’ Friday’s, with a different thing every Friday. Anyway, this week I’ve decided to do some nail art. I know the photo isn’t very good, as it’s very hard to take a good focused picture one handed! One other thing, I promise you the daisy looks so much better in real life than in the picture, as its close up you can see too much detail, if that makes sense? Anyway I’ll carry on with it! 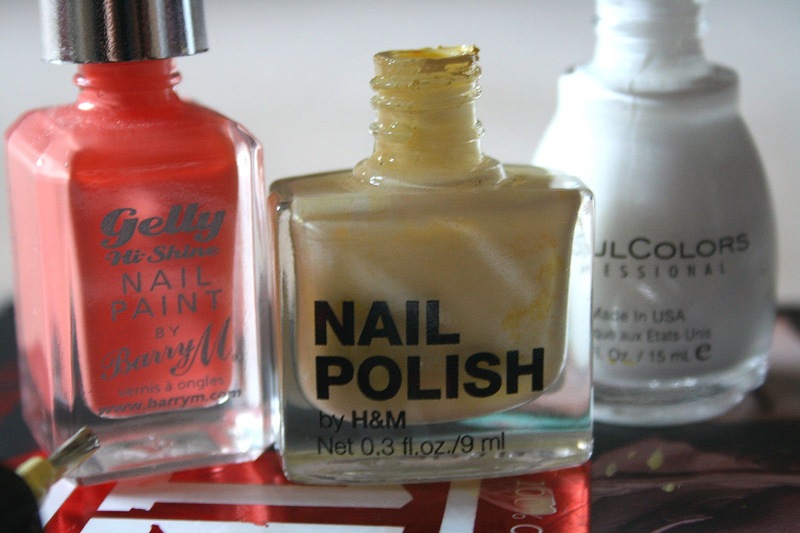 For this nail art I used the nail polishes, Papaya by BarryM, Want a Lemon by H&M, and Snow Me White by Sinful Colors. theme of spring/summer and daisies! Step Two: I have used the brush on the left, the one covered in yellow nail varnish, to put the dot in the middle of my daisy. 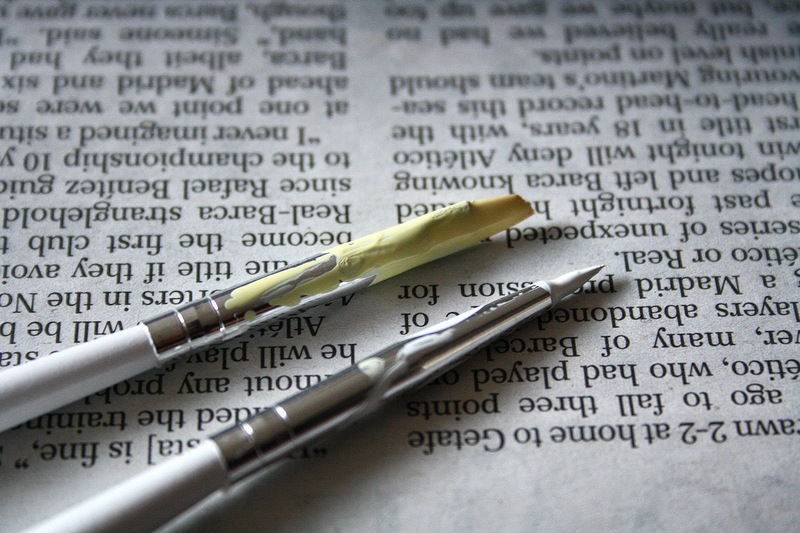 I purchased a set of 15 nail art brushes off eBay for 99p. I know many would be put of that they’re 99p but let me tell you, they are amazing! So worth getting in my opinion. Step Three: You don’t really have to wait until your yellow dot in the middle is dry, so then you take a smaller and finer brush to draw out your petals. The brush covered in white on the right. Gently swipe it along to make petal shapes, then leave it too dry. Step Four: And there you have it! I have only done this on my thumb, but of course you could do it on each nail. I have to warn you, the opposite hand to which you write with is a lot harder too do, so make sure you have a steady hand when doing it! haha. 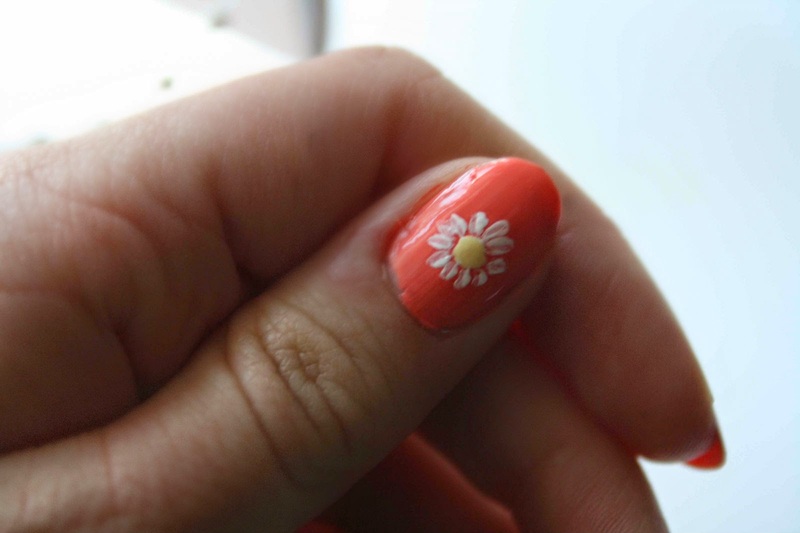 Thanks for reading, and I hope you have a go at trying to do a daisy type nail art. Please comment if you tried this and what else you’d like to see on my blog and I’ll be doing some more posts on requests.